Of all the different ways the bible refers to the Holy Spirit Jesus’ description liking the Spirit to the wind to Nicodemus is my favorite. “The wind blows wherever it wishes, and you hear the sound of it, but you do not know where it comes from and where it is going. So is everyone who is born of the Spirit.”” (John 3:8, LEB) It is my favorite because while the wind itself is invisible it is however observable by what it does. Two days ago there were no leaves in our yard yesterday the wind blew in out of the north not only dropping the temperature but also filling our yard with leaves from neighboring trees. Before going further there is one thing I believe about the Holy Spirit while it is possible to place “It” between two quotation marks and say this is who and what the Holy Spirit is it would be impossible use enough words to put between the quotation marks. However, that must not stop us from trying because when we try we learn and we experience. One of the characteristics of wind we cannot over look when the wind and the Holy Spirit is the wind pushes it does not pull. Therefore the Holy Spirit pushes us where it wants us to go. A couple of the phrases I struggle with are “The wind blows wherever it wishes… So is everyone who is born of the Spirit.” I understand Jesus to be saying, “When you are born of the Spirit “It” is free to push you in the direction “It” wishes you to go.” I struggle with those phrases because there are times when I don’t want to be pushed. There are times when I want my life to go in the direction I want it to go and when I pursue my own direction I encounter the strong divine headwind of the Holy Spirit. 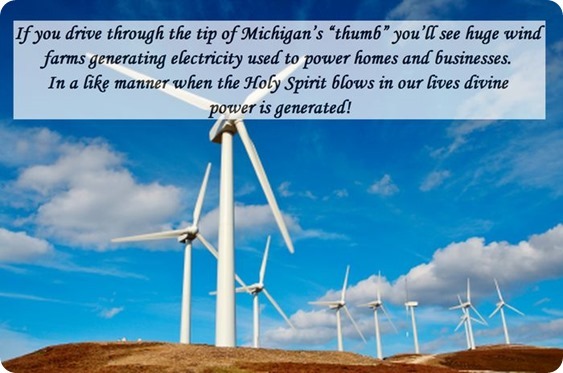 In addition to the Holy Spirit likened to the wind I also understand “It” as electricity. Like the wind you cannot see electricity however unlike the wind electricity goes in a predestined direction determined by God. Both wind and electricity are sources of power. If you drive through the tip of Michigan’s “thumb” you’ll see huge wind farms generating electricity used to power homes and businesses. In a like manner when the Holy Spirit blows in our lives divine power is generated! Last year at this time I was recovering from quadruple heart bypass surgery while the Holy Spirit was pushing me on the road of recovery it was at the same time generating the power I would need to not only recover the surgery but also recover from the heart attack that would come in early November of that same year. And as always what the Holy Spirit does for me and in me will be done to you as well. My advice, try not to go against the WIND it’s a tiresome futile journey, besides there’s no greater power than the power of the Holy Spirit! Believe it! Experience it! Enjoy it!